Toothbrush hygiene the American Dental Association (ADA) recommends changing out your toothbrush every 3 months. After normal wear and tear your bristles start to get worn out creating a less effective toothbrush. Clinical studies show that a worn out toothbrush removes less plaque than a new toothbrush. Your toothbrush builds up a large number of bacteria, so common sense practices also suggests to replace your toothbrush every 3 months. It is also a good idea to replace your toothbrush after getting over a illness. Keep the earth green almost 50 million pounds of plastic toothbrushes make it to our landfills every year. All that plastic can take up to 1,000 years to decompose and can even leak pollutants into the surrounding soil and water. Its time to make a difference, WowE bamboo toothbrushes are not only biodegradable but there are many upcycling ideas the handle can be used for. Garden markers and stirring sticks are just a couple of the many upcycling ideas. Bamboo grows super fast, over a yard per day that's over 3 feet every single day, plus bamboo can grow in close proximity to each other. Bamboo works great as a toothbrush because it naturally repels water, doesn't splinter. Now why would you use anything but bamboo? WowE bamboo WowE is today s toothbrush choice for environmentally and hygiene conscious men, woman and children. Its bamboo handle and brush base are biodegradable, light and hand-friendly. 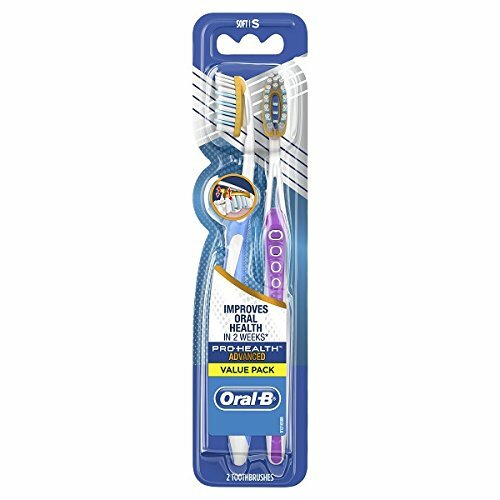 Wowe s soft, optimum bristles, made from BPA-free, recyclable nylon are perfect for all ages teeth and gums. 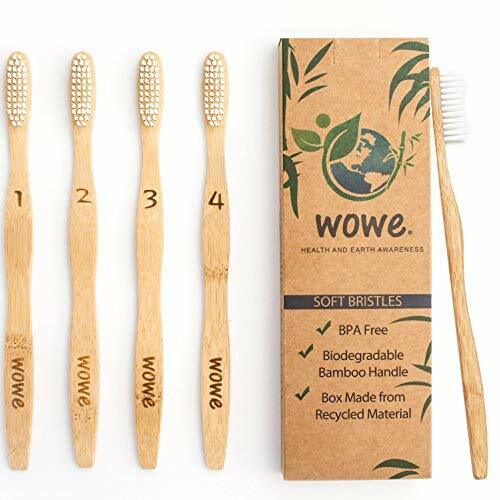 Equal to the life of any plastic toothbrush, WowE elevates conscious product choices with its earth sustaining packaging and overall ecology-minded appeal. 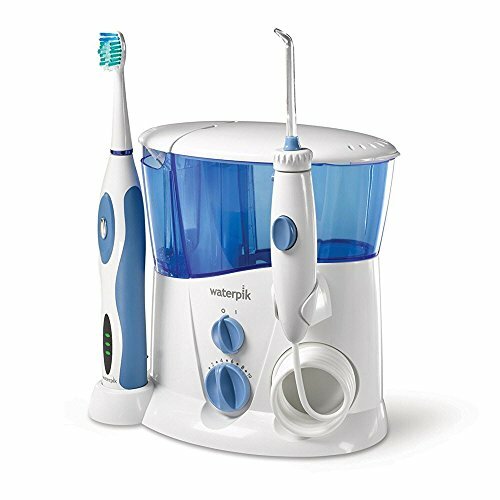 The Waterpik Nano-Sonic Toothbrush features a compact, ergonomic handle design and 16,000 gentle sonic brush strokes per minute. Its unique high-low pattern of soft, end-rounded bristles effectively cleans plaque from hard-to-reach areas. Includes a replaceable AAA battery. 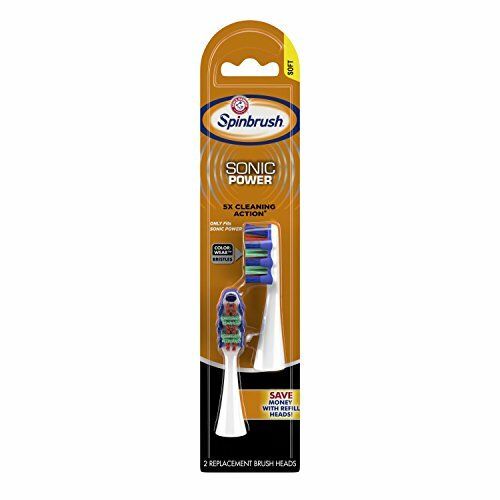 ARM & HAMMER Spinbrush PRO+ Sonic Power Replacement Brush Heads keep you stocked with fresh toothbrushes. So you keep your Spinbrush spinning and continue removing 2 times more plaque in many of the hardest to reach areas. The Color-Wear bristles on this toothbrush give you a clear indication on when you need switch them out when the color faces, it s time for a new brush head. Plus, this brush comes with 2 replaceable batteries. Includes two soft ARM & HAMMER Spinbrush PRO+ Sonic Power Replacement Brush Heads. For clean and healthy teeth and gums, choose ARM & HAMMER powered toothbrushes. Versatile and affordable. Gentle yet powerful. For generations of families, ARM & HAMMER is the natural choice for taking care of every member of your family. Our toothbrushes, laundry, cat litter, toothpastes and personal care products deliver the quality you can count on, from the brand you trust. Versus a manual toothbrush. Data on file. Nano Sonic Replacement Brush Head. Soft, end-rounded bristles gently but effectively remove plaque from hard-to-reach areas. Go Bold with the NEW Slim Sonic Designs from VIOlife Whether your style is classic, trendy, boho, or rocker-chic, there s one accessory that is certain to go with any outfit a dazzling smile. With VIOlife s Slim Sonic portable sonic toothbrush, achieving a sparkling smile while having fun with fashion is easy and the new Slim Sonic collection is the chicest yet! Bold and feisty Leopard (rawrrr!) Cool Camo print Sleek Metallic Ruby, Purple and Peacock Neon-hued, flirty Lip Smack (mwah!) Hip Houndstooth Slim Sonic is convenient and truly portable with a snap on vented mascara style cap. It stays clean and dry, making it perfect to carry in a purse, cosmetic case, backpack, or briefcase. With the fantastic array of colors and prints, you won t be able to settle on just one. There s a Slim to coordinate with every outfit, whether you re feeling minimalist or spicing it up with print and color. Impossibly chic and incredibly portable, the new Slim Sonic works just as well for a jaunt to Paris as it does for some freshening up after a holiday soiree. Slim also makes for an adorable stocking stuffer! About VIOlife VIOlife s award winning products have been acknowledged by the industry and the consumer press for our innovation and design, having received numerous awards including the prestigious Housewares Design Award, and is listed as one of Time Magazine s Coolest Inventions of the Year. For more information visit our website www.violife.com. Oral SteriClean is an FDA Listed Medical Device that is clinically proven to Safely Kills Harmful Germs and Fight against serious diseases. Proven to protect against much more than just the common cold, Oral SteriClean safely kills harmful germs and bacteria that live deep within your toothbrush bristles. Promotes a Healthy Lifestyle and easy to use. Oral SteriClean is a toothbrush sanitizer and holder all in one. After each use, the toothbrush and electric heads are kept clean in the sanitizers until their next use. 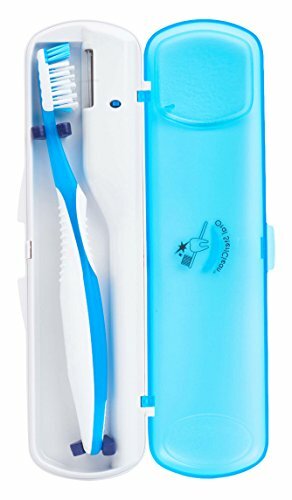 Oral SteriClean Portable UV Toothbrush Holder and Sanitizer is durable, made with a sturdy case, automatically turns on and off, and uses 2 AAA batteries. Recommended most by Health Professionals. 100% Satisfaction Guaranteed and No Hassle Return. Published in Bio Medicine, Dentistry IQ and more. An FDA listed & clinically proven medical device. Fits most manual toothbrushes & electric heads. Keeps toothbrush clean while traveling. Easy to carry in Purses, Luggage, Backpacks, & more. Convenient, easy to use & clean. Automatic turn off. Uses 2 AAA Batteries. 100% Satisfaction Guaranteed and No Hassle Return. Published in Bio Medicine, Dentistry IQ and more. Bonfit America, Inc., the official home of Steripod, Brush-T, QOLF & PlayNine. Bonfit America was incorporated in 1992 to market and sell innovative products from around the world. Many of our products have enjoyed tremendous success outside of North America. Our mission is to bring these products to consumers throughout the world and to continue delivering innovative products, designed to improve and enhance your life. Please let us know if you have any further questions about our products! 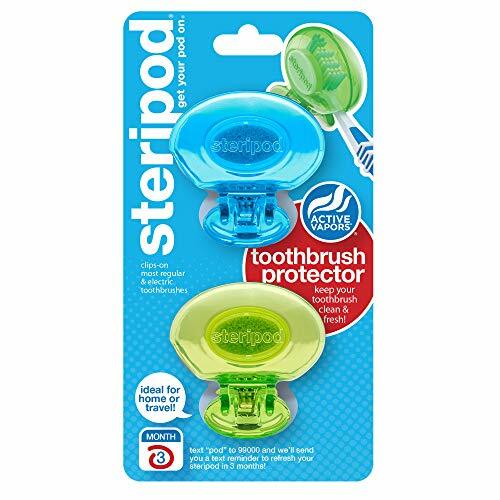 PROTECTS: Steripod's active vapors help keep your toothbrush Clean & Fresh! 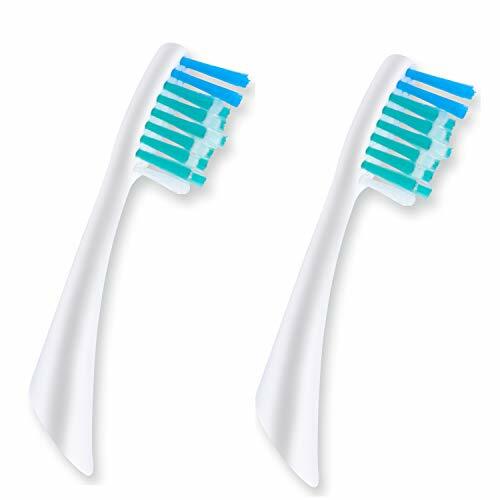 SUITS: The Steripod Toothbrush Protector works on regular & electric toothbrushes! EVERYWHERE: The Steripod Clip-on Toothbrush Protector is perfect for: home, travel, gym, camping. AGAINST: Hair, dirt, sand, etc. EASY: No cables or batteries required - just clip it on and stay clean. From the number 1 natural oral care brand comes the toothbrush that's good for your smile and your world. The NEW Tom's of Maine Naturally Clean toothbrush has a recyclable plant-based handle that is made from renewable castor oil plants instead of petroleum and is recyclable through our TerraCycle collection program. An angled neck and dye-free, multi-height bristles are precisely designed for effective cleaning. And freedom from BPA and artificial colors means you're making a good choice for you and your family. The slim sonic brings a whole new dimension to sonic toothbrushes, merging fashion, ease of use, and best of all, its slim size make it a perfect on-the-go companion. It's convenient and truly portable with a snap on vented mascara style cap. Designed for the smart, on the go, fashion forward woman who appreciates value and products that deliver what they promise. It stays clean and dry, making it perfect to carry in a purse, cosmetic case, backpack, or briefcase. 22,000 brush strokes per minute at the push of a button. This is a true sonic toothbrush preferred by dentists vs. Regular electronic toothbrushes producing only 7,500 brush strokes per minute. Brush head is replaceable (1 additional replacement head is included). Includes: slim sonic, 1 extra brush head, 1 AAA battery. Great style coupled with smart function is a key part of everything made at violife. From the original countertop sanitizer to UV sanitizing travel toothbrush holders, denture cleaners, mouth guard cleaners, cell phone sanitizers and portable electric toothbrushes, violife continues to marry great style. Even a hint of fashion. To otherwise mundane items. People who buy violife care about their health, their home, their family, and their personal sense of style. The Slim Sonic brings a whole new dimension to sonic toothbrushes, merging fashion, ease of use, and -best of all- its slim size make it a perfect on-the-go companion. It's convenient and truly portable. Fashion meets functions with a great big healthy smile. Designed for the smart, on the go, fashion forward woman who appreciates value and products that deliver what they promise. SLIM is the first portable sonic toothbrush with a snap on vented mascara style cap. Simply press the button and 22,000 brush strokes per minute leave you with a clean, beautiful and healthy smile. SLIM SONIC comes styled in an array of fashionable finishes, so they can be discreetly displayed in style. Includes 2 brush heads and 1 AAA battery making it ready to use right out of the package. 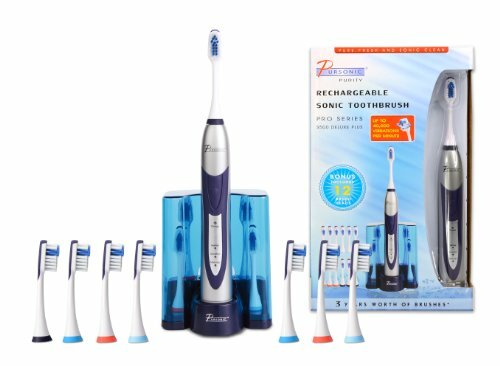 The Sensonic Professional Plus Toothbrush features an advanced ergonomic handle, three unique brush heads, two speed settings for gentle cleaning or maximum plaque removal, and a deluxe recharge indicator gauge. It also features hygienic brush head covers, a premium travel case, and a 2-minute brushing timer with 30-second intervals to ensure adequate brushing time throughout the mouth. Toothbrush is the home to harmful microbes like e-coli, salmonella, streptococcus & germs that just rinsing won't destroy. Toothbrush to toothbrush contamination is a leading cause of the spread of infections and viruses in your home, even for those with good oral hygiene. The purpose of a toothbrush sanitizer is to eliminate these microbes. It uses germicidal ultraviolet light and kills 99.9% of germs and bacteria. This toothbrush sanitizer utilizes ozone and photo cataylist technology to kill germs and bacterium.Thoroughly cleans the viruses and germs left behind on your toothbrushes,shavers, tongue cleaners. The S500 deluxe plus oral care system includes a rechargeable toothbrush designed with sonic wave technology that provides 40,000 sonic strokes per minute to effectively remove plaque without irritating your gums. It's ideal for those hard-to-reach areas and removes even the toughest stains to leave your teeth naturally whiter! It comes with a 2 minute timer with a 30 second vibrate alert in order to remind you to brush a different quadrant of your mouth, The 4 color coated brush heads are great to share this product with up to 4 different users. The storage case can hold up to 6 brush heads. 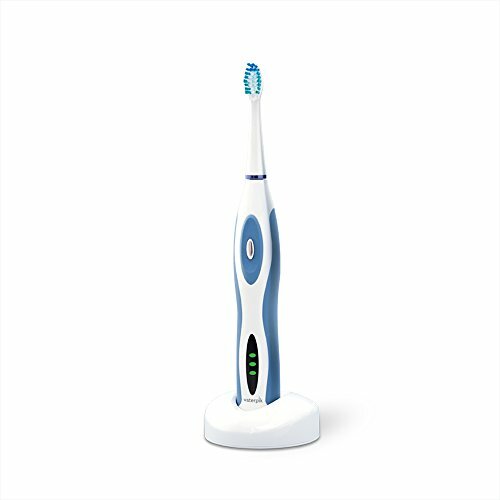 Features: sonic wave technology, 40,000 ultra powerful strokes per minute, removes microscopic plaque and bacteria left behind by other toothbrushes, three modes, power/clean, soft/gentle and massage modes, east-to-remove toothbrush heads, multiple colored toothbrush heads for easy identification for shared use, docking/charging station with enclosed sanitary toothbrush head holder, includes 12 replacement toothbrush heads, 1 year warranty, avoid being locked in with other toothbrush manufacturers with expensive replacement heads. Our toothbrush includes 12 heads. After that, replacement heads will always be affordable. For replacement heads, see model No.# RB58. 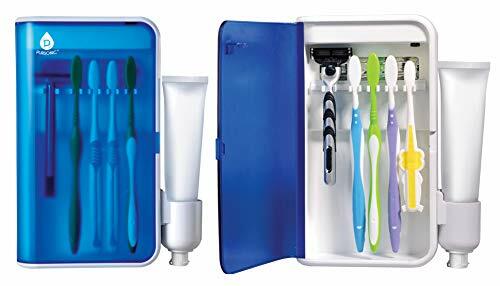 What's in the box: Pursonic S500 ultra high powered sonic electric toothbrush, charging dock with AC adapter, 12 brush heads , 1 year warranty, user manual. Sonic wave toothbrush with 40,000 ultra powerful strokes per minute. Easy-to-remove brushheads allow the entire family to use main unit. Included brush heads are in assorted colors for easy identification. Timer/Alert: Auto shut-off after two minutes of brushing. Auto-alert when brushing the same area for more than 30 seconds. AMAZING VALUE OF 12 BRUSH HEADS INCLUDED. Our SLIM Sonic toothbrush is the first battery operated, portable toothbrush with a vented mascara-style cap. Now you can smile in style wherever you are; at the office, after lunch, or before your special night out. With the Slim Sonic, you'll have your pick of a variety of stylish designs in a compact case that's perfect for anywhere you go. Best of all, you'll receive an extra brush head FREE, and the SLIM design is compatible with all Violife toothbrush sanitizers. 22, 000 brush strokes per minute guaranteed with a one year manufacturer warranty. 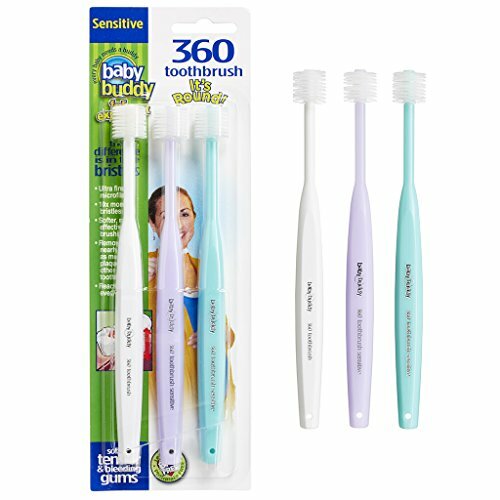 Brilliant Extra Soft Toothbrush by Baby Buddy, for Expectant, Pregnant Mothers Prenatal & Postnatal Care, helps to Prevent Hyperemesis Gravidarum & Pregnancy Gingivitis, Care for Sensitive Teeth & Sore Gums. The Brilliant Toothbrush revolutionizes the industry with its unique design featuring bristles 360 degrees around the toothbrush head. This innovative concept means you can better get in all those hard to reach places to ensure a clean, attractive smile and healthy teeth. As your body changes with pregnancy, so too do your gums, resulting in sensitive teeth and gums prone to bleeding. Designed specifically to nurture an expectant mother's sensitive teeth and gums, the Brilliant Toothbrush has more than 18,000 extra-soft, micro fine bristles-almost 20 times more than the average toothbrush. This gives you optimal cleaning power that is soft and gentle on tender and bleeding gums. Part of the Brilliant Oral Care Program, the Brilliant Toothbrush for the Expectant Mom, lays the foundations of proper oral care for you and your baby. The program continues onto caring for you baby s tender gums and budding teeth right from birth and throughout each stage of life. Buddy s Brilliant Toothbrush's bristles are short, but made of extra-soft, highly elastic, ultra-fine micro fiber. Intended for ages 12 and up. Measures 9 x 3 x 0.7 inches. 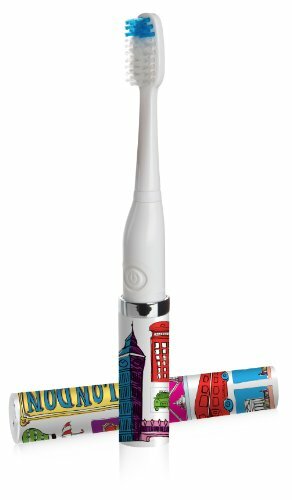 Slim sonic destination takes our popular slim sonic toothbrush to popular travel destinations, merging fashion, ease of use, and best of all, its slim size make it a perfect on-the-go companion. It's convenient and truly portable with a snap on vented mascara style cap. Designed for the smart, on the go, fashion forward woman who appreciates value and products that deliver what they promise. It stays clean and dry, making it perfect to carry in a purse, cosmetic case, backpack, or briefcase. 22,000 brush strokes per minute at the push of a button. 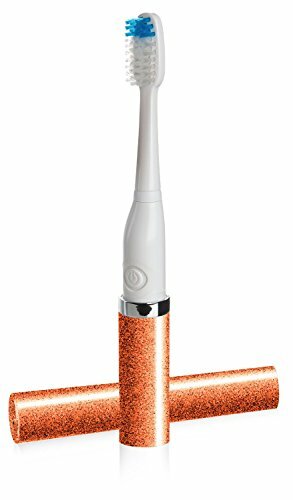 This is a true sonic toothbrush preferred by dentists vs. Regular electronic toothbrushes producing only 7,500 brush strokes per minute. Brush head is replaceable (1 additional replacement head is included). Includes: slim sonic, 1 extra brush head, 1 AAA battery. Great style coupled with smart function is a key part of everything made at violife. From the original countertop sanitizer to UV sanitizing travel toothbrush holders, denture cleaners, mouth guard cleaners, cell phone sanitizers and portable electric toothbrushes, violife continues to marry great style. Even a hint of fashion. To otherwise mundane items. People who buy violife care about their health, their home, their family, and their personal sense of style. Tom's of Maine Toddler Training Pack is perfect for home or on-the-go. The toothbrush is made with extra soft bristles for sensitive teeth and gums. 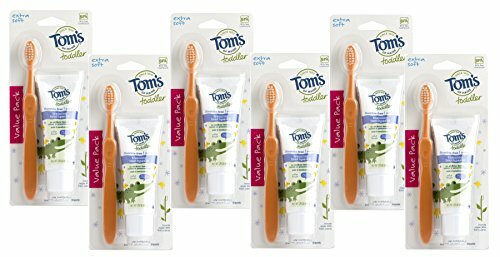 Made with BPA free plastic, the toothbrush is paired with the #1 selling natural toddler toothpaste - Tom's Mild Fruit Training Toothpaste. This mild formula is fluoride free, safe if swallowed, and gently cleans teeth and gums with no artificial flavors, colors, or preservatives. Fluoride Free. Safe if swallowed. No artificial flavors, colors, or preservatives.